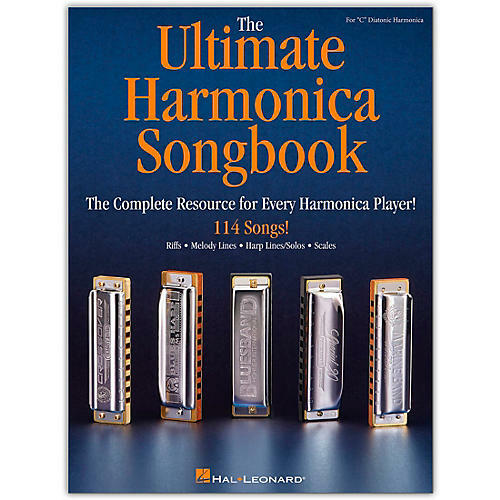 Hal Leonard The Ultimate Harmonica Songbook Harmonica - The Complete Resource for Every Harmonica Player! If you're headed to that desert island with your harmonica this is the only songbook you'll need to take along! It includes 114 songs from a variety of genres, presented in a variety of formats. Presented in riffs: Another One Bites the Dust · Beat It · The Distance · Iron Man · Smoke on the Water · Superstition · and more. Presented in melody lines: Crying · Everybody Wants to Rule the World · Fever · Folsom Prison Blues · Free Fallin' · Green Onions · Hallelujah · I Am a Man of Constant Sorrow · I Shot the Sheriff · La Cucaracha · Lean on Me · Me and Bobby McGee · Ode to Joy · Proud Mary · Smells like Teen Spirit · Tequila · Wonderwall · and more. Presented in harp lines with solos: Born Under a Bad Sign · I'm Your Hoochie Coochie Man · Karma Chameleon · Low Rider · Mary Jane's Last Dance · Sunshine of Your Love · and more. Major pentatonic scales in 1st, 2nd & 12th positions as well as minor pentatonic scales in 2nd, 3rd, 4th and 5th positions are also presented.